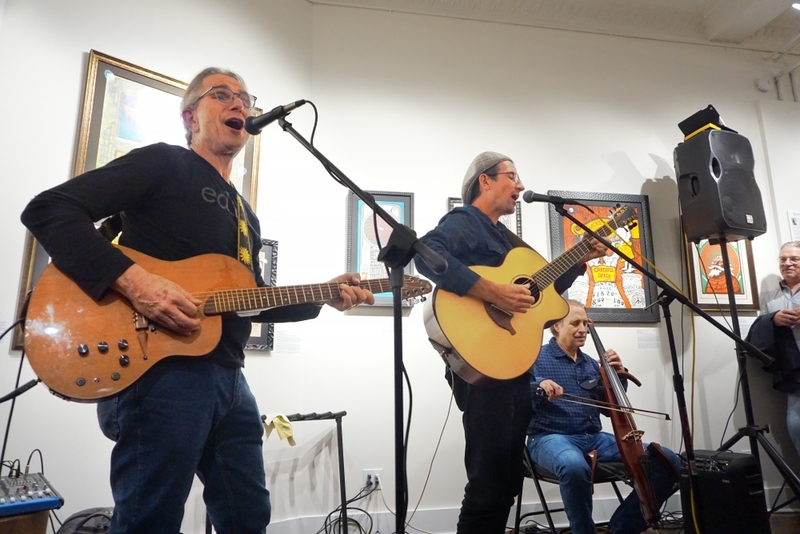 David Gans and Stephen Inglis, performing as Fragile Thunder, entertained a rapt crowd of 100 at the Bahr Gallery on Friday, November 16. Patrons were treated to a guest appearance by Von Cello and the musical event was preceded by a 90 minute “meet and greet” and book and CD signing session by both artists. The evening began at 7:00 with guests mingling with David Gans and Stephen Inglis, getting books and CDs signed and enjoying the usual gallery-style refreshments. The setting at the Bahr Gallery included 26 Grateful Dead posters in the main gallery where music was played, while the back galleries held another 40 iconic and rare posters from the entire late 1960s period. By the time the evening was over, 5 pieces had red dots on them. The special Grateful Dead Exhibition continues through December 23. The musical part of the evening began at 8:30 with two solo Hawaiian pieces by slack key guitar virtuoso Stephen Inglis, Makee Ailana and Firemen's Hula. The pieces were accompanied with wonderful Hula dances by the beautiful Uila Marx, Stephen’s niece. Then David Gans stepped in and the two broke into a Scarlet Begonias with fine jams and backing vocals by the enthusiastic crowd. Scarlet tumbled down into High Time, followed by Dark Star with some soulful improvisation coming off the strings of electric cellist Von Cello who came down from Westchester to join the group. He fit in perfectly with the ensemble and later rocked the crowd during Not Fade Away when he lifted the cello sideways and played it like a guitar. Dark Star meandered (in a good way) through space before landing on Wharf Rat which again became a mass singalong, until the jam eventually made its way back into Dark Star. Very sweet. The set also included Jacqueline, an original David Gans composition, Days Between, and ended with the rollicking Not Fade Away. The players were met with wide and sustained applause for their creative and masterful interpretations of these seminal tunes. Though the evening was up no one would leave without an encore, and Fragile Thunder treated us to another opportunity to join in chorus to a heartfelt Brokedown Palace. The evening also served as an opportunity to raise money for the Community Foundation of Oyster Bay and the non-profit was handed a check for $700 following the event.